Is there anything better on a Fall evening than a slice of delicious, creamy cheesecake? 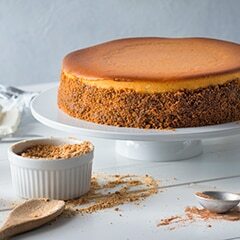 Try Country Crock's tasty Pumpkin Cheesecake recipe today! Place 13 x 9-in. roasting pan filled halfway with water on bottom rack in oven. Preheat oven to 325°. Combine cookie crumbs, 1/4 cup sugar and 1/4 cup Country Crock® Baking Sticks in small bowl. Press crumb mixture onto bottom and halfway up sides in a large springform pan; set aside. Beat cream cheese and remaining 1-1/2 cups sugar and 1/2 cup Country Crock® Baking Sticks in medium bowl, with electric mixer until mixture is creamy, about 3 minutes. Beat in pumpkin, flour and pumpkin pie spice until smooth. Gradually beat in eggs, cream and vanilla until smooth. Pour into prepared springform pan. Bake in center of oven 1 hour 30 minutes or until edges are golden and middle is almost set. Without opening the door, turn oven off and let cheesecake stand in oven 30 minutes. Cool completely on wire rack. Cover and refrigerate overnight. Best if made 1 day ahead.